Cisco-Eagle Catalog - Plastic Sleeved Steel Handrail - Starter, 42&quot;H x 5&#39;L x 1.9&quot;Dia. 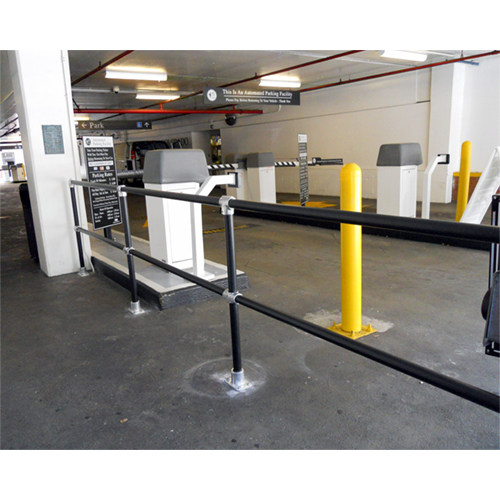 Barriers & Rails > Guard Rail Systems > Handrail Systems > Plastic Sleeved Steel Handrail > Plastic Sleeved Steel Handrail - Starter, 42"H x 5'L x 1.9"Dia. 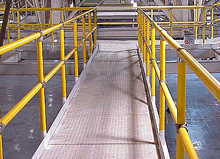 Starter handrail sleeved in a durable, weather resistant HDPE with magnesium alloy fittings gives your steel handrail system a stylish, maintenance free finish that lasts for years. Containing ultra-violet and anti-static additives, the sleeve material resists fading, cracking and electrical conductivity while alloy fittings do not chip, peel or rust. Select from a wide range of colors to add a vibrant tone to your facility or select silver or black for a more understated look. Core mount, plate mount and removable applications are available with adjustable fittings for slopes and unique environments. System ships in fully assembled sections and installs with no on-site welding or hot work. All you need is an allen wrench to complete assembly. Removable and re-usable to match changing floor plans. Meets OSHA and BOCA fall-protection standards. Adding quality steel handrail to your property has never been easier or looked so good. Begin with a 5 foot starter unit, then complete your handrail run with the appropriate number of 5 foot adders. Next, choose your preferred installation method - core drilled or base plate mount. Then select the color for the durable rail sleeves. Each starter/adder order will be fulfilled with the required hardware needed to make a single run mounted per your selection from start to finish. By following the easy instructions, installation is a simple task whether using base plate mounts or core drilling into concrete flooring for extra sturdy support and stability. Comes fully assembled. Custom configurations available upon request for slopes, three-line, picket, and infill designs. Drill core hole at pre-marked location. With the help of another person, slide the handrail posts into the pre-drilled holes. 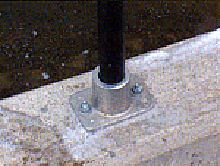 Back-fill around posts with cement to firmly anchor posts.